Introduction to design. Fundamentals of material balances. Fundamentals of energy balances. Flow-sheeting. Piping and instrumentation. Costing and project evaluation. Materials of construction. Design information and data. Safety and loss prevention. Equipment selection, specification and design. Separation columns (distillation and absorption). Heat transfer equipment. Mechanical design of process equipment. General site considerations. Appendices: Graphical symbols for piping systems and plant. A simple flow-sheeting program MASSBAL. Corrosion chart. Physical property data bank. Conversion factors for some common SI units. Standard flanges. Typical design project questions. Index. An introduction to the art and practice of design as applied to chemical processes and equipment. It is intended primarily as a text for chemical engineering students undertaking the design projects that are set as part of undergraduate courses in chemical engineering in the UK and USA. It has been written to complement the treatment of chemical engineering fundamentals given in Chemical Engineering volumes 1, 2 and 3. Examples are given in each chapter to illustrate the design methods presented. Of value to undergraduate and postgraduate chemical engineering students and graduates of other technical disciplines (such as mechanical engineering) in industry wishing to learn the fundamentals of chemical engineering design. Ray Sinnott's varied career, mainly in design and development, began with several major companies including Dupont and John Brown. The main areas covered within these appointments were: Gas Production and Distribution, Nuclear Energy, Elastomers and Textile fibres. After his career in industry he joined the Chemical Engineering Department, University of Wales Swansea in 1970, specialising in teaching process and plant design, and other engineering practice subjects. 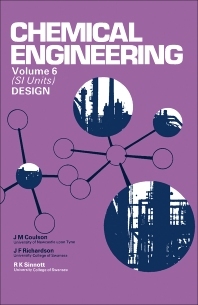 The first edition of Chemical Engineering Design (Coulson and Richardson’s Vol 6) was published in 1983. Subsequent editions have been published at approximately 5 year intervals. Ray Sinnott retired from full time teaching in 1995 but has maintained close contact with the engineering profession.